Stallion Feature: Empire Maker Returns to Reign Again– When stallions are shipped to other countries, it is usually because they have been unsuccessful in the breeding shed. However, Empire Maker has been a successful sire in both America and Japan, where he has stood at stud since 2010. The son of Unbridled stood at Juddmonte in 2004, beginning his career with a stud fee of $100,000. Belmont Stakes 135 winner Empire Maker has been a successful sire in both America and Japan. Empire Maker was a very successful racehorse with a short career. In less than a year on the track, he never finished worse than third in any of his eight starts. 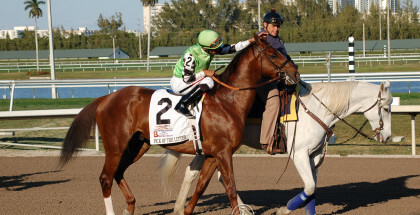 His best wins came in the Florida Derby, Wood Memorial, and the Belmont Stakes (all Grade I). In the Belmont, he notoriously ended the Triple Crown run for the Distorted Humor gelding Funny Cide. Afterward, Empire Maker finished second in the Jim Dandy, which ultimately ended up being his final start after a fever kept him out of the Travers and a foot issue kept him from the Jockey Club Gold Cup. 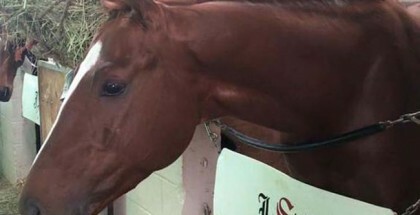 The foot issue was the same one that had bothered him in the Kentucky Derby. After the racing world enjoyed Empire Maker, he was sent off to stud, and he stood for seven seasons in America before being sold to Japan in November of 2010. In the breeding shed, Empire Maker was not only a hit – he was bred to be a hit. Empire Maker’s sire, Unbridled, won the 1990 Kentucky Derby and Breeders’ Cup Classic. Unbridled is the only stallion to sire different winners of all three Triple Crown races. Empire Maker is out of the blue hen mare Toussaud, a daughter of the British champion and classic winner El Gran Senor. Toussaud is considered a blue hen for not only producing Empire Maker and his half-brother Chester House but for producing five Grade I winners from five different stallions. As a stallion, Empire Maker has produced multiple Grade I winners and a few champions. In his first crop, he had a filly sell for $1.6 million in the 2006 Saratoga sale while his first-crop yearlings averaged $380,000. In his first crop, Empire Maker sired multiple Grade I winners, including Country Star and Mushka. With those two fillies, it was noticed that Empire Maker crossed well with Seattle Slew, the 1977 Triple Crown winner. Seattle Slew also sired Empire Maker’s half-sister, the very fast Honest Lady. Honest Lady went on to produce First Defense. The Danzig sire line also crosses well with Empire Maker as he sired graded stakes winner Acoma. Acoma was part of her sire’s second crop, as was Pioneerof the Nile. 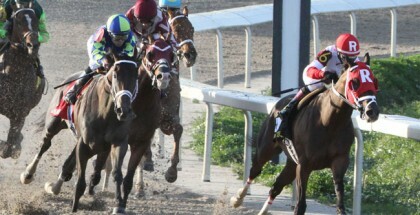 Pioneerof the Nile finished a tough second in the 2009 Kentucky Derby behind 50-1 longshot Mine That Bird. After that race, Pioneerof the Nile retired, going on to sire a Grade I winner in Bodemeister and 2015 Triple Crown winner American Pharoah. As the sale of his third crop came about, the stallion’s yearlings averaged $250,000 with top sellers going for $1.7 million and $950,000. Empire Maker crosses well with just about any sire line but seems to enhance mares that carry Danzig or Seattle Slew in their pedigrees. This especially includes the A.P. Indy sire line. 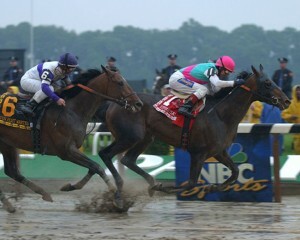 His top offspring include Royal Delta, Soaring Empire, and Empire Way, results of crossing with the A.P. Indy/Seattle Slew sire line. Other top offspring include Bodemeister (Storm Cat), Pioneerof the Nile (Lord at War), Battle Plan (Seeking the Gold), In Lingerie (Storm Cat), Grace Hall (Ezzoud), and Emollient (Touch Gold). Rumor has it Empire Maker is returning to the United States for 2016, and although it is unclear whether or not he will remain here permanently, the stallion will likely be very popular with American breeders, especially after his grandson just won the first Triple Crown in 37 years. This is likely a factor in his possible return. No matter the reason why he is returning, America has gained another stallion it lost from its breeding scene. Empire Maker is likely to be well-received by American breeders. Keeneland Sales Week One: Numbers are Up!